A school bus driver was ticketed for violation of right of way following a Friday morning accident near a Santa Rosa County school. Bus driver April Stone, age 36 of Pace, was stopped at a stop sign at Sports Drive at Highway 90 when she pulled into the path of a Suzuki motorcycle driven by 36-year old Samantha Ann McClung of Milton, according to the Florida Highway Patrol. McClung was transported to Sacred Heart Hospital in Pensacola in serious condition. She was wearing a helmet. Stone and her passenger, 62-year old Carol L. Nugent of Cantonment, were not injured in the crash near S.S. Dixon Primary School in Pace. A Flomaton woman was jailed after an early morning cutting in Century. Chelesa Dianne Boutwell, 19, was charged with aggravated battery with a deadly weapon following the incident about 3 a.m. in the area of Pond and Ramar streets. 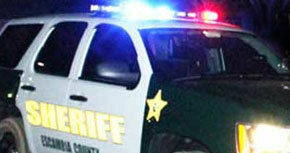 The Escambia County Sheriff’s Office responded to Jay Hospital after receiving a report of a cutting victim. They discovered 21-year old Hannah Joyce Campbell of Century had 8-10 cuts to her face and hand from an unknown sharp object. Campbell was transferred to a Pensacola hospital for further treatment for her injuries. Boutwell told deputies that she had been having problems with Campbell for about a week. The pair became involved in a physical altercation, and Boutwell admitted to hitting Campbell several times. Boutwell said when she noticed that Campell was bleeding, she stopped and helped her up off the ground. Boutwell told deputies she did not know how Campbell was cut, but believed the injuries may have been caused by a ring on her finger. Boutwell was booked into the Escambia County Jail with bond set at $10,000. Editor’s note: Boutwell’s mug shot was not immediately available due to a power failure at the jail this morning. The Catholic Crusaders swept the Northview Chiefs Thursday in high school volleyball action. 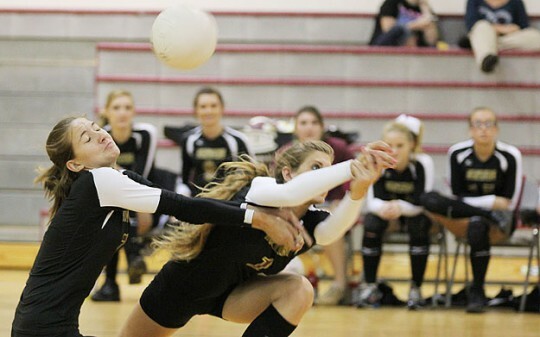 Northview fell to Catholic in three varsity sets, 17-25, 23-25, 20-25. 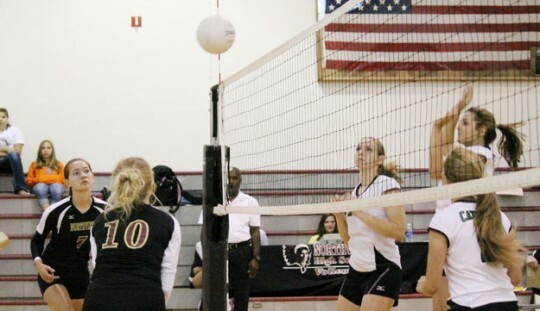 Misty Doran had five kills for the Lady Chiefs, while Taylor Roberson recorded two digs. Also for NHS, Morgan Payne had thee blocks and one kill. 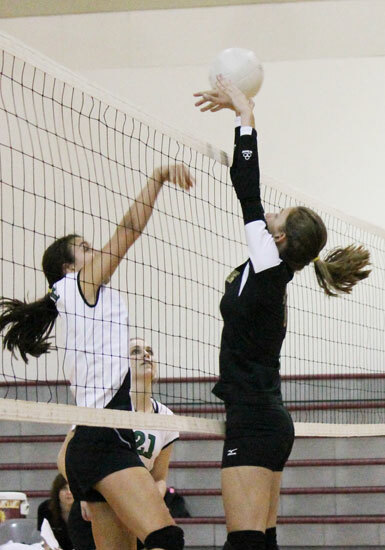 In junior varsity action, Northview lost to Catholic in two, 11-25, 8-25. The Lady Chiefs will next be on the road at Laurel Hill Tuesday afternoon. Northview will return home to Bratt to host Central next Thursday at 4:30 for JV and 5:30 for varsity. Pictured: The Northview Chiefs take on Catholic High Thursday afternoon. NorthEscambia.com photos, click to enlarge. With a blend of presidential nominee Mitt Romney’s biography, a few parting shots at President Barack Obama and a surprise and surprising appearance by Clint Eastwood, the Republican National Convention in Tampa closed, even as Florida remained central to the presidential election. It was a night studded with stars of the Florida Republican scene, a nod both to the critical role the state’s 29 electoral votes will play in the November election and the Latino populations that could dictate the outcome in several other swing states. But the star of the night was still Romney, a former Massachusetts governor whose sometimes uneasy relationship with the party’s conservative base seemed to be replaced, at least for an evening, with an enthusiastic embrace. 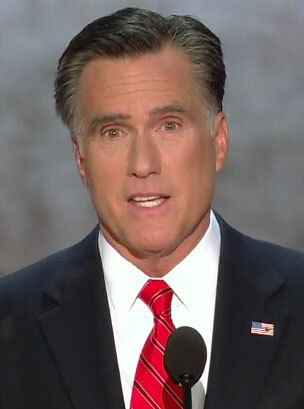 In an acceptance speech that lasted almost 38 minutes and drew several resounding ovations, Romney promised to create 12 million new jobs and usher out what he framed as the divisive tone of Obama’s four years in the White House. Most of Romney’s criticism of Obama, though, was couched as disappointment in a president who came to office four years ago as a popular sign of America’s promise only to prove unable to better manage the grinding and sputtering recovery that’s followed. Saying that “what America needs is jobs,” Romney cast himself as pragmatic and focused on the economy where Obama’s concerns were out of touch with the nation and its people. Romney ticked off five planks of his economic plan that he has referred to repeatedly in recent weeks: Pursuing energy independence, improving education, crafting and enforcing new free-trade agreements, pushing the federal budget back toward balance and slashing taxes and regulations affecting small businesses. But Romney did not delve deeply into the nuts and bolts of his policy, a decision that is likely to keep him open to charges from Democrats that he has not leveled with the American people about his plans for the nation. “With no new plans and evasion about his real plans, Mitt Romney leaves this convention no stronger than he came,” Obama campaign manager Jim Messina said. Democrats also zeroed in on the similarities between Romney’s promise of 12 million in five steps with the “7-7-7″ plan that now-unpopular Gov. Rick Scott ran on in 2012. “Floridians have reason to be skeptical of a wealthy businessman promising jobs,” tweeted state Rep. Rick Kriseman, D-St. Petersburg. And voters in Florida, which is the largest state likely to be up for grabs on Election Day, were undoubtedly among the targets for the Romney campaign Thursday night. Former Gov. Jeb Bush blasted Obama for blaming the slow economy on the administration of his brother, former President George W. Bush, while U.S. Sen. Marco Rubio was chosen to introduce Romney. 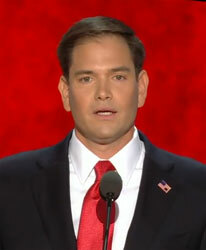 Rubio also got in his digs at Obama. The night largely focused on Romney’s biography. Speakers included people whom Romney helped as the lay leader of his Mormon church in Massachusetts, Olympians who highlighted Romney’s success in turning around the 2002 games in Salt Lake City and business partners who pushed back aggressively on Obama’s criticism of Romney’s tenure as the head of Bain Capital. Also on hand was Clint Eastwood, whose surprise appearance at the convention included a dialogue with an empty chair that he said represented Obama. 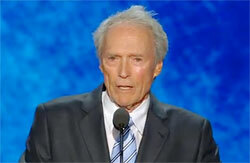 Eastwood then proceeded to grill the chair about Obama’s presidency. “When somebody does not do the job, you got to let them go,” Eastwood said. The Escambia County Board of County Commissioners is seeking county residents to serve on a Blue Ribbon Task Force to develop the blueprint for library operations for 2013 until 2018. The plan will include the goals and objectives that will guide library services for the West Florida Library System. The committee will envision, evaluate and assess community needs with distinctive programs and services for library operations. The committee will have the potential to revamp and streamline the processes that enable libraries to respond quickly to rapidly changing environments of providing library services. The final document produced as a result of this committee will provide a future plan for the West Florida Library System. The committee is expected to meet for approximately six months in order to complete this task. The Board of County Commissioners will select five members for the Task Force, one representing each district. If you are interested in serving on the task force, or for more information, contact Marilyn Wesley, Community Affairs Department Director, at (850) 595-3130. Please include contact information and what county district you live in on the resume. The deadline for resumes is Friday, September 7, 2012. As the waters from Hurricane Isaac recede, the damage done is becoming evident along the coast. State Road 399, which connects Pensacola Beach to Navarre, is expected to be closed for months. Asphalt is washed away and buckled; the National Park Service says the damage is from water washing up the sand from underneath the roadbed. 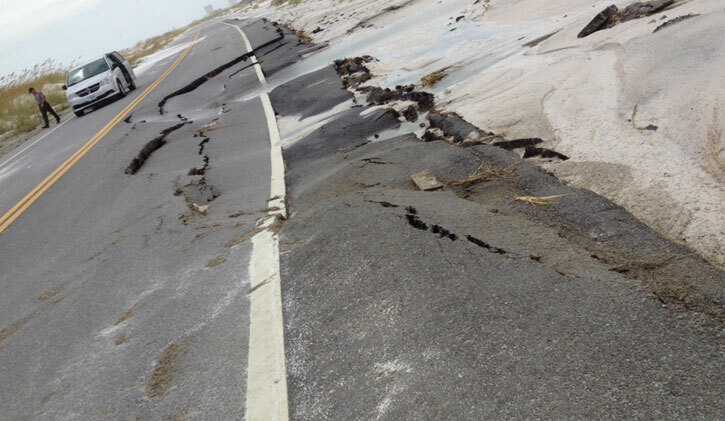 Pictured: Damage along SR 399 between Pensacola Beach and Navarre. Photo by Anthony Pura, WEAR for NorthEscambia.com, click to enlarge. Hunter safety training lead by Florida Fish and Wildlife trained volunteers will be offered next month at the Langley Bell 4-H Center. Classes will be held from 6-9 p.m. September 11, 13, 18 and 20 with the shooting range portion of the course on September 20. Participants must be 12 or older; anyone under 16 must be accompanied by an adult. Preregistration is required. To register or for more information, click here or call Libbie Johnson at Escambia County Extension at (850) 475-5230 or email libbiej@ufl.edu. 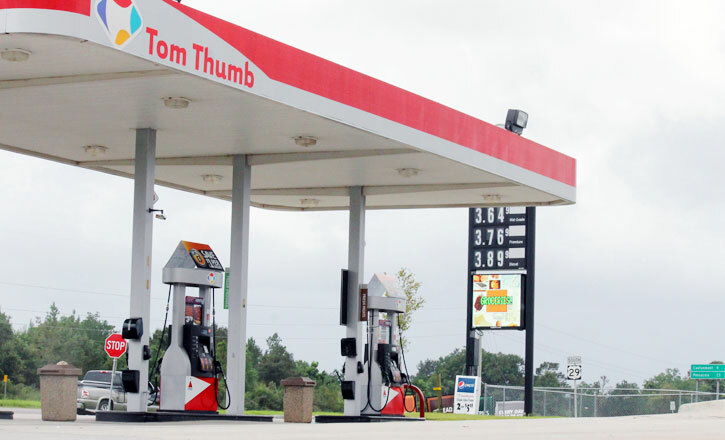 Gas prices jumped again Thursday in the wake of Hurricane Isaac, meaning drivers will be faced with the idea of costly fill-ups as they take a final summer spin for Labor Day weekend. According to AAA, gas prices jumped a couple of cents per gallon to a national seasonal record of $3.82. That gallon of gas was also up a nickel on Wednesday as Isaac pounded the Gulf Coast. AAA predicts the price will rise through the weekend before moderating or falling as oil companies restart their operations in the Gulf of Mexico. Florida’s average price per gallon for regular unleaded was $3.78 Thursday, while the Pensacola area was at an average of $3.67, up from $3.57 one year ago. Pictured top: A gallon of regular unleaded was was $3.64 Thursday afternoon in Molino, just below the Pensacola metro average of $3.67. NorthEscambia.com photo, click to enlarge. Here is tonight’s high school football schedule from across the North Escambia area. Headed to a game? Share your photos — email them to news@northescambia.com tonight! John Paul II Catholic at Northview, 7 p.m.
West Florida at Escambia, 7:30 p.m.
Catholic at Choctaw, 7 p.m.
Washington at Navarre, 7:30 p.m.
Arnold at Pace, 7:30 p.m.
Milton at Crestview, 7:30 p.m.
Monroeville at Flomaton, 7 p.m.
T.R. Miller at Escambia County (Atmore), 7 p.m.
Escambia Academy at Hooper Academy, 7 p.m.
Holtville at W.S. Neal, 7 p.m.
Four people were arrested after deputies responding to a domestic violence call near Atmore located a suspected meth lab Thursday. The Escambia County (Ala.) Sheriff’s Office received a 911 call in reference to a male and female fighting in the yard of a home at 89 Bell Fork Road, just off Highway 21. As deputies were responding to the home, they received a second 911 call from a female, 34-year old Dana Bullin of Atmore, at the Creek Smoke Shop near Highway 21 and I-65. She was transported by ambulance to Atmore Community Hospital for treatment of injuries allegedly received during the altercation. During their investigation, deputies said they determined Bullin had entered the residence on Bell Ford Road and allegedly assaulted Larry Paul and Jamey Bullin before taking Jamey’ Bullin’s wallet. Deputies obtained a search warrant for the residence, where they discovered what they believed to be illegal narcotics, including crystal methamphetamine, marijuana, hashish and prescription medications. Deputies and narcotics agents also recovered items typically used in the manufacturing of methamphetamine. Dana Bullin was charged with theft of property second degree and domestic violence assault third degree. Jamey Bullin, age 35 of Stockton, was charged with unlawful possession of a controlled substance, unlawful manufacturing of a controlled substance second degree, first degree unlawful possession of marijuana and unlawful possession of drug paraphernalia. Larry Paul, Jr., age 36 of Atmore, was charged with unlawful possession of controlled substance, unlawful manufacturing of a controlled substance second degree, unlawful possession of marijuana first degree and unlawful possession of drug paraphernalia. Robert Mayo, age 21 of By Minette, was charged with unlawful possession of controlled substance, unlawful manufacturing of a controlled substance second degree, unlawful possession of marijuana first degree and unlawful possession of drug paraphernalia. All four were booked into the Escambia County Detention Center in Brewton to await a bond hearing.